Are you scratching your head trying to figure out how you can improve your revenues from Google Adsense? Well, before you learn the tips on how to improve revenue from Google Adsense, you need to be careful with your ads. Do not violate Adsense policies by placing your ads in places that force those who visit your website or blog to click on them. Also, you should never ask anyone to click on your ads or click on them yourself. 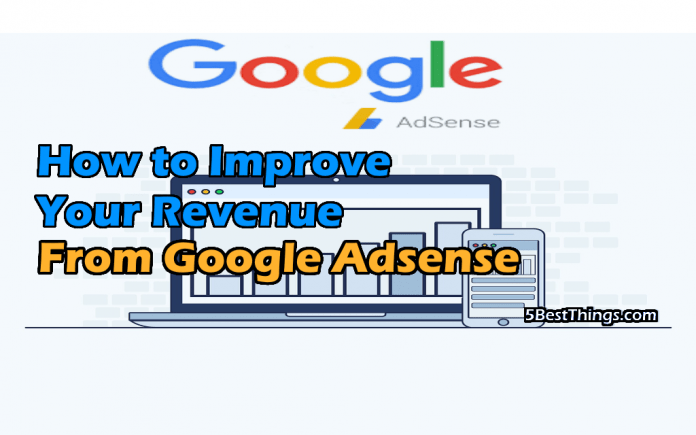 Now that those valuable pointers are out of the way, take note that Adsense’s new interface comes with simple and user-friendly features that will aid you in your quest to increase revenue. It offers section targeting, removal of low paying category, ad optimization and ad blacklisting just to name a few, that you can use to boost your income. Here is how to increase your Google Adsense earnings today. Writing content that links back to your website or blog is vital and when done right, you’ll see your revenue shoot up within a short period. First, have a look at your numbers and find out which day you had the highest earnings. When you get to that, find out which post you had published. There is a high likelihood that those who read your content clicked on another page because they wanted to learn more about what you shared. This activity increased pages per visit which consequently led to increased ad impressions. In addition, you will be able to use Twitter’s URL shortener, T.co to know that a certain number of page impressions has yielded high returns. This information will enable you to know which content you should promote. Another trick for improving Google Adsense revenue is allowing your ad units to show both text and images ad types. This increases the competition for ads to appear on your website. With more advertisers competing, you are guaranteed to get higher bids for ads and therefore increasing your revenue. By use of these recommended tweaks, website and blog publishers on average see a 59% increase in eCPM earnings. To make these changes, go to your ‘My ads’ tab and then click on the ‘Edit ad type.’ As a result, you will see an increase in cost per click thereby generating more revenue, even if you are not raising the number of clicks on your website. A report by Google indicates that wider ads have a higher tendency to do well than tall ads. Readers found them friendlier as it allows them to read content easily. The consistent reading pattern comes with an increase in click rate. Also, advertisers favour wider ads. Therefore, you should consider using wider ads if you haven’t already. Start simple. Change ads on popular pages and monitor eCPMs. If the ads perform well, then you can resize the ads on your whole website. Publishers have noted 0.35 eCPMs when they have used wider ads. A wider ad blends well at the end of a post. Just make sure it differs from other ads on your site. The position of your ads will determine the number of clicks that your ads get. The more visible your ads are, the greater likelihood of page visitors to see it. To judge this, visit other websites and check out how different websites place their ads. Do you notice them as soon as the page loads? If so, then you can steal a trick or two about ad placement from the website. Experiment with ad placement and monitor the click rate. Place an ad on the sidebar, at the top of the sidebar and another at the bottom. Avoid being intrusive with your adds as you may put off visitors. If you master the art of ad placement, you will reap big on Google Adsense revenue. Publishers have realised that people don’t click on ads they come across Facebook as much as they do on Twitter. This is because Facebook users are more interest in the content than the ads. Twitter users are good referrers as they seem to always be in a browsing mood, clicking on ads and content in their feeds. Twitter gives you the luxury of posting multiple links. By use of Google Analytics, you can identify your referrers that are valuable to your Adsense earnings. Click on content, Adsense and then Adsense referrers. Here, you will be able to see all the websites that lead visitors to click on your ads together with the revenue. Aim for a higher CTR and eCPM among your top referrers. Also, take note of why they are higher for some referrers than others. Improving Google Adsense revenue doesn’t have to be rocket science. Do your research and combine the tips above and other tips you know to increase revenue. Don’t shy from experimenting. Give yourself time to master the tips, and you’ll see your revenue increase.